The doctors at Atlanta Eye Care deliver comprehensive eye care solutions. The following special eye testing routines are an integral part of the service. A high-definition digital image of the retinal area helps us diagnose and manage eye diseases in the delicate retinal area. Damage to these delicate structures of the retinal area is often the first sign of systemic diseases such as MS, diabetes and more. The retina is known as the window to the body, and routine retinal imaging helps monitor the year-to-year changes in your eye health. OCT Technology enables us to better manage glaucoma and diseases of the retina. OCT’s high-definition images allow us to see beneath the eyes’ surface to the nerve fiber layers where damage occurs. OCT delivers early detection of such common eye diseases as macular degeneration, diabetic retinopathy, and glaucoma. Early detection allows our experienced doctors to treat these diseases more effectively. Today’s high-resolution lenses require laser-precision measurements to perform their best. The Visiofﬁce system from Essilor allows our opticians to obtain every possible parameter required for modern lenses with extreme accuracy. Our Visioffice system will let you see your best from your new custom, digital lenses from Varilux. No-line bifocals and single vision lenses can be produced precisely the way your eyes will be using them. 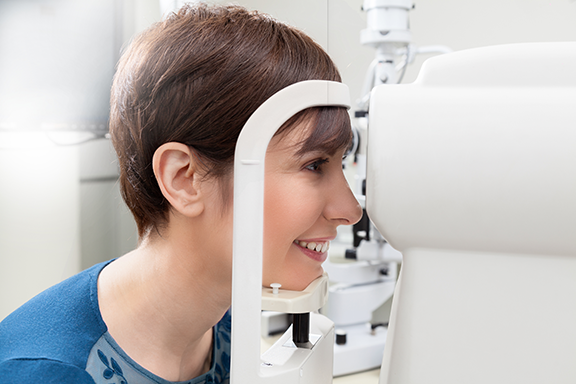 Visual Field testing can help save vision because it is another test used to diagnose or rule out glaucoma and other neurological disorders that affect vision. This simple, but effective service has saved lives by detecting various medical conditions such as strokes, brain tumors, and other neurological defects. A cataract is a clouding of the lens inside the eye. The lens sits just behind the pupil and is responsible for focusing light. As the lens increases in cloudiness, it becomes more difficult to see objects clearly and bright lights can cause glare. The most common form of cataract is that of aging and it is inevitable as we mature. In most cases, cataracts do not cause any harm to the eye and cataract surgery is only done to improve the vision in which glasses no longer can improve the vision. Cataract surgery is more the patient’s decision than ours because we usually recommend surgery only when the cataracts are affecting your daily life. There is no harm in delaying surgery if your life is only minimally affected. Special Eye Testing: We are able to offer our patients the best diagnostic and treatment options because of the special testing we do. You are in great hands with the doctors at Alpharetta Eye Clinic or Windward Eye Care. If you are in Alpharetta or anywhere in North Fulton, you are close to one of our offices. If you are experiencing any difficulty with your eyes, call for an appointment.